Last week while in my recipes think tank, better known as my bed, while trying to fall a sleep I was thinking of what kind of soup could I make for lunch the next day. This soup needed to be one that my vegetarian husband could eat and that I would enjoy too. This was not an easy task as there are not a lot soups that I enjoy that don’t contain meat, poultry or seafood! I’ve wanted to make tomato soup for a while now. This is one of the soups I disliked, sorry HATED, the most as a little girl, but I wanted to try my own version to see if I like it now. Well, adding the roasted pepper turned out to be an excellent idea and this Tomate and Roasted Pepper Soup was born. It was absolutely delicious. Heat the olive oil in a medium pot over medium heat. Add the onion and cook for about 5 minutes or until translucent. Add the garlic and cook for 2 minutes more. Add the tomatoes and red pepper and cook for 5 minutes. Add the water, vegetable bouillon tablet, basil, oregano, cumin, salt and pepper. Simmer for 25 to 30 minutes over medium-low heat. 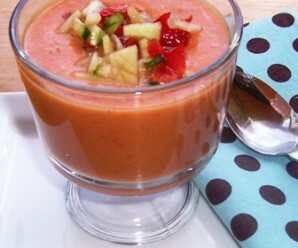 Transfer the soup to a blender or use an immersion blender and puree until smooth. Transfer the soup back to the pot and bring to a boil. Remove from the stove and add the heavy cream. Season with salt and pepper if necessary and serve hot. Must confess I’ve never made tomato soup from scratch. I’m intrigued with your recipe and now that we’re having cooler weather, it’s the perfect time to try it! I would love this soup too! It seems quite easy to prepare.. This is the season for soups and I am looking for options for my vegan month. This soup minus the cream should work great. I’m a first timer to your blog and everything looks delicious. I am a soup lover, make soup several times a week. My story is the reverse of yours. I grew up in the Northeast US and moved to Venezuela with my Maracucho husband. The other night I was craving a different soup and ended up making sweet potato and red pepper. It was delicious, especially with a slice of my mother-in-laws pie de acelgas. I’m sure I’ll be back to see what you’re posting. Delicious Erica! This is my favorite soup combination! I’ve never made tomato soup before but looks inviting. I also think what I am going to make the next day ,..in my bed! haha,… Your soup is a real winner! Yum! I so love the deep red coulour!! Very Christmassy! Oh this recipe sounds great! Looks delicious, funny how your tastes change as an adult – I hated tomato soup too, but I think its because it was from a can. Now I love making tomato based soups, and this one sounds delicious with the addition of roasted pepper. This looks like a fabulous soup, I like all the spices and herbs you added. This looks so delicious….and comforting. Sounds wonderful and I love the combination of tomatoes and roasted peppers here! Love the contrast of the gorgeous red soup with the white bowl! It looks delicious! 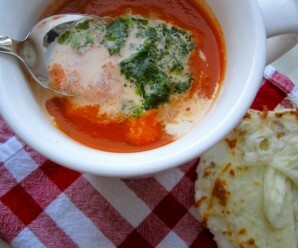 Great looking soup, a cookbook worthy photograph and plating. I bet the pepper added a nice smokiness to the soup. 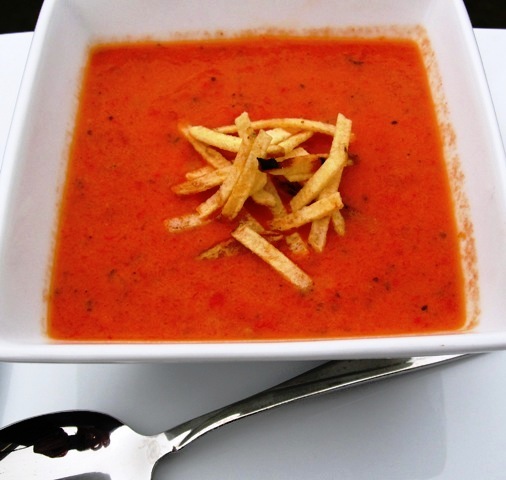 i love tomato soup and the addition of roasted pepper….sounds wonderful! This is very my kinda soup, lovely flavors and sun burst colors. Erica: Thank you so much for providing this recipe. I made it today as part of a a welcome dinner for my parents visiting from FL & my aunt visiting from Colombia (they’re driving up & are due to get here in about an hour or 2). I was starving & could not wait, so I had some 😉 OMG! It is so delicious! I poured a little balsamic vinaigrette when plating & it is to die for. I can’t wait til they get here so we can feast! FYI: I’ve come to rely on ur website pretty often. I used ur pollo asado recipe as well as ur Torta de 3 Leches for tonight’s dinner too. I’ve made these 2 previously & both have been a hit. Keep the great work & keep those recipes coming. Having recipes to refer too makes it so much easier to cook like my mom does!